nine × = 81 Required Please enter the correct value. The Alibaba IPO price has been climbing since talks of the initial public offering first gained traction in 2013. In December, most analysts thought it could rival the $16 billion Facebook Inc. (Nasdaq: FB) offering for largest tech IPO in U.S. history. 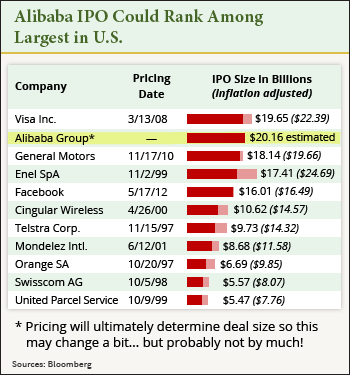 Today, consensus estimates place the Alibaba IPO price closer to $20 billion. That would make it the largest U.S. IPO in history, surpassing the $19.65 billion Visa Inc. (NYSE: V) raised in its 2008 initial public offering. The company's valuation has been growing, too. According to a recent survey of analysts by Bloomberg, Alibaba was valued at $154 billion. In 2013, consensus estimates had the company valued at $63 billion. Last year, China supplanted the United States to become the largest e-commerce market in the world. "Online-shopping spending in China reached $298 billion last year, easily surpassing U.S. sales of $263 billion," Money Morning's Executive Editor Bill Patalon said. "According to German research firm yStats, China's consumer e-commerce market soared more than 60% in 2013." The impact of the market was felt last Nov. 11, a day in China known as "Singles' Day." It's a holiday where single men and women shower themselves and each other with gifts. On that one day alone, more than $5.7 billion exchanged hands over Alibaba's two main sites. "Alibaba is the dominant e-commerce player in a marketplace – China – that's seeing incredible growth in online commerce," Patalon said. "According to the research I've seen, e-commerce in China is projected to hit $540 billion by 2015, and that's just for starters. By 2020, China's e-commerce market will be worth more than the United States, the United Kingdom, Japan, Germany, and France combined. So we know that growth is coming… and we know that Alibaba is the No. 1 gun." "Despite that torrid growth, China is still very much an online market in development – meaning the profit opportunities are huge," Patalon said. "For instance, the impact of social media in China is four times what it is here in the U.S. market."